On a flop of , Marcel Roosen moved all in and John Caldwell insta-called, turning over to Roosen's . The turn was the , the river was the , and Caldwell's railbirds erupted in raucous cheers as he took it down. Poker News' own editor-in chief is the champion of Event #4, while Roosen, who won entry to this event via a Poker News freeroll, is our runner-up. Congratulations to John "Schecky" Caldwell! 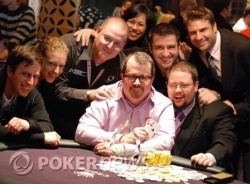 Always patient, never making a bad move, Caldwell played fantastic poker to take down this title. John Caldwell moved all in from the button and Marcel Roosen called. Caldwell slapped on the table, in great shape against Roosen's . The flop was , the turn was the , the river was the , and Caldwell doubled up, taking a commanding chip lead over Roosen, with 891,000 to Roosen's 136,000. The flop was , the turn was the , the river was the and Caldwell doubled up. Both players are now about even in chips with approximately 500,000 each. We're now heads-up between Marcel Roosen and John Caldwell. John Caldwell raised to 120,000, Marcel Roosen called, and Russell Watkins called all in from the big blind. The flop was . Roosen checked and Caldwell checked behind. The turn was the and both players checked again. The river was the . Check-check again. Roosen turned up , Caldwell mucked, Watkins mucked and Roosen took down the pot as Watkins headed to the rail in 3rd place. Zhi Hong Ma moved all in from the small blind and Marcel Roosen called. The flop was , the turn was the , the river was the and Ma was eliminated in 4th place. Russell Watkins moved all in from the small blind and John Caldwell called from the big blind. The flop was , but the spiked on the turn and Caldwell took the lead. The river was the and Caldwell doubled to 360,000 while Watkins was left with 78,000. John Caldwell moved all in from the button and Marcel Roosen called from the big blind. The flop was , the turn was the , the river was the and Roosen doubled up to 320,000.